As a budget conscious parent I’m always on the lookout for fun things to do with the children that don’t cost anything. The natural world has a lot to offer, and as we mooched about the site on a recent camping trip, an idea presented itself …. We were collecting twigs for a campfire, and as we scanned the sun-bleached grass for suitable tinder wood my mind began to play tricks – were the twigs lying randomly on the ground, or was there an order to their arrangement? After going slightly cross-eyed, I vaguely recalled reading ages ago of some psychological research around the idea that the brain seeks to find familiar shapes out of random forms – it’s one of the reasons why cloud watching works so well. In seeking order from the twig-collection my brain was finding apparent pathways, and it struck me we could make a simple treasure trail. 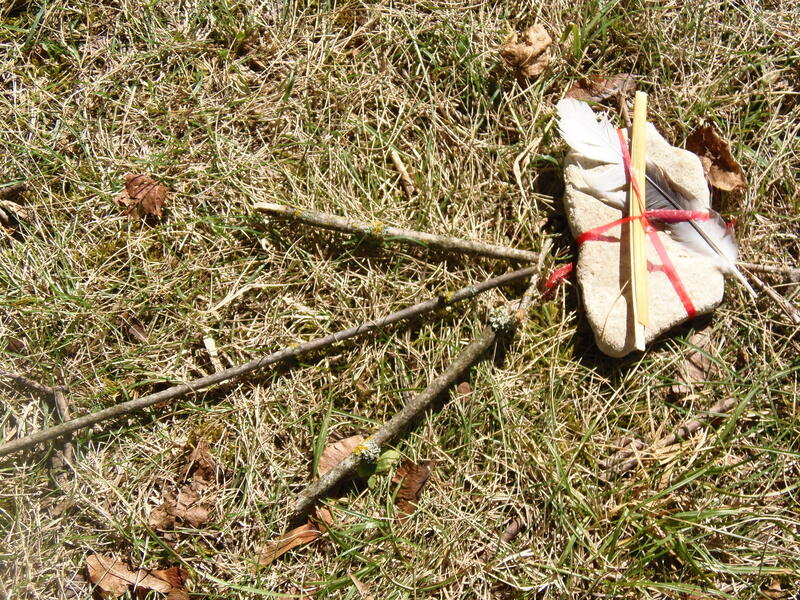 So we arranged arrows every few paces on the ground, in a meandering path around the site, and the children had great fun following it (well, Joe, 2, tried to dismantle it, but was eventually dissuaded from his task with the lure of a mid-afternoon snack!). Not satisfied with just a trail, my daughter decided that it must lead to some treasure. So we hunted for precious things that would make suitable booty. A pale flat stone, a feather and a perfect blade of yellow hay caught her imagination. A stray red strand of thin plastic, which I think was originally a tie for a bin bag, made the perfect ribbon and bow for our parcel. Trail and treasure complete, we had a fun hour hiding, tracing, and discovering … a game that was repeated with multiple changes of route and secret hiding places for the treasure.